Make a conscious effort to drink water all day. Most of us run around slightly to severely dehydrated. Dehydration is not only caused by the lack of water we intake, it is also the dried and processed foods we eat that soak up any potential fluids in our body. 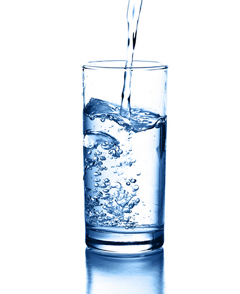 Many respond to the dehydration facts with, “I drink a lot of water,” and that’s great. But are they eating hydrating foods, or just a lot of dry stuff? By increasing fluids in your diet, huge physical changes can occur inside and out. In just a day or two you will feel better: less-puffy eyes, a flatter tummy, more energy, glowing skin.